Rating: 1, Clever, but dialogue needs improvement. 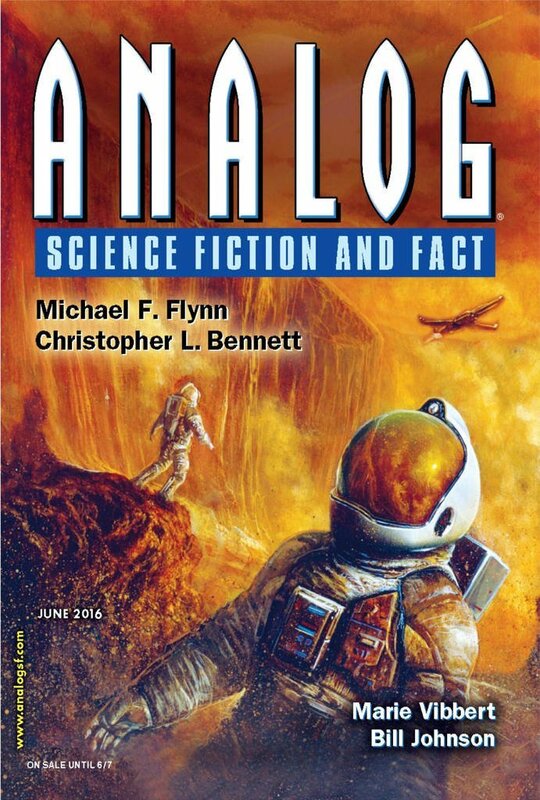 "Hold the Moment," by Marie Vibbert, appeared in the June 2016 issue of Analog Science Fiction and Fact, published April 29, 2016, by Penny Publications. Pro: The ending is just perfect. When the story says that Daisy waited anxiously for several minutes, our first thought is "oh, the author made a mistake; no time should pass," but the last line explains everything. Nicely done! Con: The dialogue is consistently unnatural to such a degree that it spoils the story. Yeah, I consider dialogue and narration to be things that a writer absolutely must get right. Almost all of them do--even at the semi-prozines. The exceptions puzzle me. I can see taking points off for bad dialog, but rating it a 1 when there weren't any other major problems makes me think the dialog must have been absolutely horrendous. I read this one a while ago now, but I don't remember the dialog being a huge issue. I'm going to have to go back, and look it over again, and see if I can see what you apparently did. There are three or four things that I think of as absolute minimum requirements for a story, and natural dialogue is one of them. If a story fails any of them, I give it one star, no matter what else the story has going for it. 95% of the time, editors just reject stories with these problems or else they direct authors to fix them. I'm always surprised when a 1-star story somehow gets into print. By "fails" I mean "fails consistently." I'll hardly give a story 1 star for a single false note. A 1-star story should be recognizable as such on almost every page. That's pretty generous, since most stories in professional publications don't exhibit any elementary writing problems at all. "You're always at work!" A direct hit to the guilt of the single mother. In this particular example, the problem isn't the dialogue itself; it's the sentence that "explains" the dialogue to us. Notice that that sentence isn't "inner monologue" (i.e. thoughts of the protagonist); it's the author ham-handedly editorializing. There's a good bit of that, and it's a part of what I mean by dialogue problems.